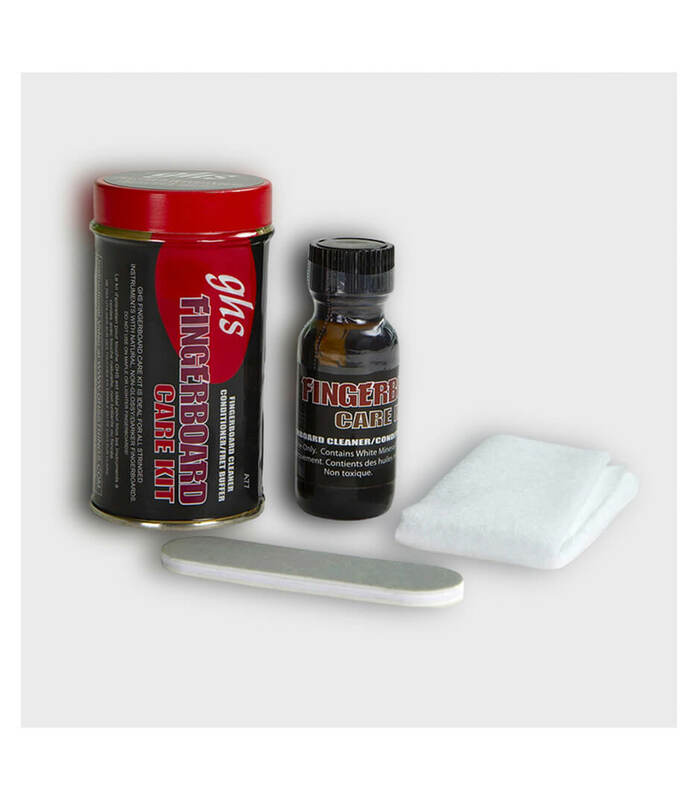 The GHS Fingerboard Care Kit makes it easy to maintain your instrument’s frets and fingerboard.The kit is ideal for all stringed instruments with natural, non-glossy, darker fingerboards. This includes acoustic, electric, classical and bass guitars as well as ukuleles and other fretted instruments. -Use the “dark” side of the fret buffer to clean your frets (always go up and down using moderate pressure. Be careful not to touch the fingerboard with the buffer). -Use the “light” side of the fret butter to polish your frets. -Use the enclosed cloth to apply the conditioner to the fingerboard. Depending on how dirty the fingerboard is you may need to use more. However, a light covering is usually all that is needed. -Using the same cloth, clean the fingerboard. Making sure you get right up next to the frets to clean any dirt/grime that may have collected next to the frets. -Use a clean/dry section of the cloth to remove the excess conditioner until dry. -Re-string with a new set of GHS Strings! A77 Fingerboard Care Kit from Ghs is 100% original and brand new. We, at Melody House take pride in our after sales service and support. For further details on the a77 fingerboard care kit, Ghs, simply write to us to consult an expert or order online and we will take care of the rest. Happy Shopping!